Don't Leave your Mog House without it. 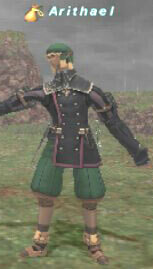 Rogue's Poulaines is without a doubt the most useful piece of AF armor there is for THF. Once you get these, you will never leave your Mog House without them. The enhanced flee effect has saved me many a times from death and really helps buy time to get away from mobs so that you can let your shadow timer cool down. If you are level 60 and don't have these, don't put off the quest to obtaining these. Although the AF quest to getting these is about as long and drawn out as the "As Thick as thieves" Rogue's Bonnet quest, this one is atleast worth completing. on the first try both of us Thiefs used SATA+ Dancing Edge, and stuff, and we killed the bomb NM got the coal first try for my drop. but for the other THF. she got aggroed and it self destructed killing her but I still had some HP. had to wait like 10-15 minutes for respawn. and the bomb didn't depop for like 10 minutes. the other thf had it worse. This mob was a pushover. my pt consisted of me 75 rdm/whm 75nin/war x2 69 thf/nin. the ???? order is way too ez, you have to be retarded to not find them in order. before fight i casted barfira, & nin used tonko, then thf popped it & used Hide. We were under the influence that as soon as it pops and we didnt have invis up it would self-destruct. we got it down to 2% when the ******* decided to self-destruct. it did 130-150 to each of us. + We got the drop, despite hearing it wouldn't drop if it popped. Please let me know I plan on trying this today. looking for help w/ Zilart missions I am on 14.And Cop 5-3/4- Lourv's path is all I need besides Snoll Tsar and I am equiped w/ lilies and salt. Cause guy who wrote guide on this quest forgot to give detail on which are the spots to check, here are the list that will help you future thiefs out. G-7, now only one left which will pop NM at I-6. Hope this helps and prevent you guys from searching information like I had to for 30 min. Good luck. pwnd by PLD75,DRG74,BRD74,WHM74,THF64... Hardest part was finding the correct ???'s. (wich isn't saying much) But be warned was hitting PLD (DEF:700+, VIT+50) for 150-250 per hit. Crit hit for 300. The ammount of damage is gona be dependent on how many berserk's he has stacked. Perhaps the bard was "hell bad"
Really not sure what this has to do w/ a BRD. So, after reading everything about this. I thought I would post how we did this. I was a bit worried after hearing how this bomb wipes out entire parties, so we took a 2 party alliance down there of people mostly over 60 with a 75 RDM/NIN, 72 WHM, and 70 RAN helping out as well. The strategy we used was having the thief activate the last ??? and then immediately use hide. The rest of our party was behind the wall there and our RDM/NIN cast invisible and then ranged attacked it to claim it so it wouldn't explode. After it was claimed, our entire party then began attacking it and made short work of it. The only problem occured when our 60THF decided to SATA DE off of our SAM and thus our SAM was toast pretty quickly. The second time around when it was my turn, our RDM/NIN wanted to solo it, so we let him and JUST TO CLARIFY... This bomb can explode even after it is claimed. I had read numerous posts that it would not explode after it is claimed, but I can say without a doubt that it does. When our RDM/NIN had him down to about 1/90th of a life, he decided to explode... killing 3 of our party members. Luckily it did drop the item and I was able to complete the quest without having to fight him again. Is there any job/s that could solo this NM? According to the post below yours, a 75THF/NIN could solo it. So far I only have the dagger, but from what I've read in this walkthrough, I can tell that it's very in-depth and should be looked into by any thf looking to acquire af gear. You have to have Divx to view this video. Speed is the key for Thiefs for max dmg. "Emotion is inevitable, why make someone feel embarassed for displaying it?" "Our job allows us to tank, solo, make money, pick chests without keys, help others get items AND can also put out damage when necessary. You CANNOT say this about another job." 'Existance' the Thief - Amen to that. As stated above: "*The boots are nice, along with adding 3 DEX, it also adds ~15 seconds to your flee"
I can't give specific locations, but I can tell you that there are two ceiling holes prior to the Banishing Gates. They only appear at the ends of the hallways and will give a direction to find the next one. There are four beyond the gates, two to the right path after the gates and two to your left. Here are some maps, but you've probably already got them in your character's possesion ingame. Check the two before the gates first, then check the two all the way at the end of the right pathway, then come back and check the last two to the left of the gates (past the RDM AF3 room). The seventh ceiling hole will spawn the bomb. I'd recommend doing the trace by yourself first if possible (w/ sneak oil and quick help from a group in there for the Banishing Gate pressure plates) so that when your alliance comes to kill the bomb you can go straight to the fight. I had to spawn it three times (and nearly kill me) because for some reason it wanted to self destruct on me the initial two times. The third time we just had 6 of our DRKs and the BLMs cast stun on it as soon as it spawned. The fight isn't too bad, you just have to find a way to engage it before it blows up. Return to the guy in Mhura that gave you the item that you're going to use to "smoke out" the bomb. He'll tell you something about a treasure that he doesn't want you to get a hold of. Head to Windurst and talk to Nanaa Mihgo. She'll say something about the fact that the first letters of each signature will spell out the word "Ordelles". Go to Ordelle's Cave in La Theine Plateau and BRING A PICKAXE. You can either buy it or steal it from a Goblin Digger in the Dunes before you make your way to La Theine. The guides don't really say much about this part, but you'll need to travel through the caves until you pass the Napalm room. There is a ??? spot on the ground outside of the cave exit in La Theine Plateau near a bed of flowers (it'll be to your left if you are travelling away from the exit). Use the pickaxe on it and you'll get the final AF cutscene, the Rogue's Poulaines, and the title "Paragon of Thief Excellence". *The boots are nice, along with adding 3 DEX, it also adds ~15 seconds to your flee time and gives a +2 to steal. Wearing all AF should get your Health above 1020 (unless you are Taru) and DEF somewhere in the 240 range. Can someone please post where this can be found? Leaping boot or Rogue's Poulaines... Should I just sell my boot for Gil as I have this? Has anyone experimented with this? How much longer does it make Flee last? yeah can someone who knows about these boots fill us in on how it affects the duration? "We Laugh At Honor and Are Shocked When We Find Knives In Our Backs". #Wrinklesw, Posted: Apr 02 2004 at 1:15 PM, Rating: Sub-Default, (Expand Post) rofl, "where do you find these?" "whats af?" #Anonymous, Posted: Jan 02 2004 at 7:04 AM, Rating: Sub-Default, (Expand Post) What's an AF? af= artifact, meaning from old ff titles, makes you look like your job.